And now that that epicness is done, we can begin! And, since Halloween is right around the corner, I figured I would review a very disturbing anime that will make you squirm. I mentioned the villain of this anime back in August, now you get to see why this anime is just as good as it’s main villain. 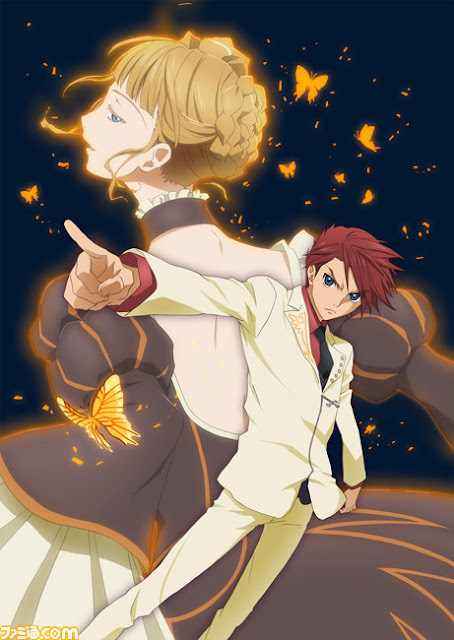 Umineko no Naku Koro ni, or When the Seagulls Cry, is a Drama/Mystery anime based on the video games from 07th Expansion as well as the manga by Ryukishi07/07th Expension. The 26 episode anime comes from Studio Deen, originally running from July to December 2009. It has yet to be licensed in America. Umineko no Naku Koro ni takes place in the year 1986, during the time frame of October 4 and October 5 on a secluded island named Rokkenjima. The head of a wealthy family named Kinzo Ushiromiya, who lives on and owns Rokkenjima, is near death, and eight of his family members arrive on the island to discuss how Kinzo's assets will be divided once he is dead. Also on the island are three family members who live there, five of Kinzo's servants, and his personal physician. After the eight family members arrive, a typhoon traps them on the island and shortly after people start to get mysteriously murdered. The main culprit is Beatrice, the Golden Witch; reputed to be the source of the family’s wealth. However, Battler Ushiromiya doesn't believe in magic or witches and decides to face off against Beatrice in order to prove how a human is capable of murder, not magic. With the clock ticking, and a riddle to solve that will endow all the family’s gold to one who solves it, who will remain alive to claim it? And just who is the real culprit, human or witch? The art style and animation of Umineko is rather simple. It has it’s moments of sure brilliance when it comes to the magic of Beatrice and others around her. It’s also a rather colorful anime, not bright and in your face, yet it’s not pastel and faded looking. The series also adds in symbols that can become rather significant at different points in the show. From the family crest to the bloody symbols on the doors of where people have been killed, Umineko doesn’t waste it’s time and remains on where it should be. Even the music is suspenseful and dark, which, even though it’s a standard of mystery stories, works wonderfully. Combining this with the Phantom of the Opera-ish opening and ending theme music, it shows how dark and mysterious this anime is suppose to be. Umineko’s story is carried out really well. Not only are you watching Battler Ushiromiya fighting against the witch Beatrice, you’re even sucked in and continuously are trying to solve the “closed door murders” that are set up for you. Add on several side plots involving many of the family members, including; George and Shannon’s relationship, Eva and her other self, Rosa’s abuse toward Maria, Maria’s own magical powers, and the mysterious girl Gretel who assists Battler in the 4th game. The story keeps it’s main focus but intelligently adds these story lines as each new game begins, keeping the story from getting old and making it more interesting as the series goes on. However, the series comes to an abrupt end at, what seems to be, more of a cliff hanger moment. Where the anime ends, the video games pick up and continue; and, unless you’ve played them, you won’t know what happens next. Only certain characters have any type of development during the series, many of them I mentioned, previously, as part of the side plots. You only see major character development from Shannon, Eva, Maria, Battler, Kanon, and Beatrice herself. However, for some of the characters, it’s more of a revelation then development, like in the cases of Maria and Shannon. For Kanon, he has a small piece of development that carries on through the rest of the series and for each game. For Eva, her development comes ONLY in the third game, for the rest of the time (Games 1, 2, and 4) she remains the same. As for Battler and Beatrice, since they are the two main players in the game, they go through a lot of ups and downs throughout. However, I have a small problem with how some development is introduced; and it mostly comes from the 4th game. All of a sudden you are thrown in a TON of information regarding Maria and Ange (Battler’s younger sister), and it takes you away from the last game for a few episodes; after which, you are suddenly tossed back in and it becomes a bit rushed. Sadly, there’s no English Dub for Umineko, so I could only watch the Japanese. I’m not saying that the Japanese was bad, it was AMAZINGLY good; it just would have been interesting to see what America could come up with for this series. Daisuke Ono’s performance as Battler was perfect! His confidence and intellect was delivered wonderfully, like a real fighter should be. Sayaka Ohara’s Beatrice was fantastic as well. Ohara gave her the cruel, confident, and strong willed personality; at the same time, there was a sympathetic and tender nature used as well when needed. As for the rest of the cast, maybe a slight better choice here or there, but overall really well done. The only other voice actress I’m going to mention is Yui Horie as Maria. I only have two words for this little girl: HOLY F***!!!! She is so sweet and innocent yet sooooo creepy it’s scary!!...... And makes me giggle. As I mentioned before, Umineko is based on the video game series from 07th Expansion; and I also mentioned that there’s more to the story after the anime ends. The series only covers the first four video games: Legend of the Golden Witch, Turn of the Golden Witch, Banquet of the Golden Witch, and Alliance of the Golden Witch. These four games are actually played out in the anime, but there are four MORE video games that come after and were released after the anime: End of the Golden Witch, Dawn of the Golden Witch, Requiem of the Golden Witch, and Twilight of the Golden Witch. Each game brings about new scenarios and a few new characters for each, and it kind of makes me understand why the anime stopped where it did. However, you don’t just stop at a place like that in an anime and not finish it. The only explanation I can probably think of for this, is that the anime was created to advertise their games. That or they haven’t finished it yet cause of the release of the last four games; Twilight of the Golden Witch, having been released in December 2010. Keep your fingers crossed for another anime season? At the end of the day, Umineko no Naku Koro ni, When the Seagulls Cry, is a very intense mystery with several versions of the incident linked together through a battle over the existence of magic. It has plenty of interesting and fun characters, and plenty of magic to go around. Umineko has been one of my favorite anime since I first saw it, and it still is today. My only request for Studio Deen..... PLEASE MAKE ANOTHER SEASON!!! !